TEL AVIV (JTA) – The controversy had sparked a national debate, raucous protests in the streets and the collapse of a historic government. That came in the months after the Israeli Supreme Court had nullified a law exempting haredi Orthodox Israelis from military service and given the government until Aug. 1 to draft a replacement law. More than one week after the law’s implementation, the Israel Defense Forces has yet to encounter any significant problems in putting haredi men through the draft process, according to a military source with knowledge of the issue. The IDF had no official comment on the new process. But political stalemate won out. No law was passed and a broad government coalition created to solve this issue broke up. The day before the Aug. 1 deadline, Defense Minister Ehud Barak sent out a news release stating that the IDF had one month to formulate guidelines on haredi military service that would accord with the Military Service Law of 1986, which subjects haredim to the same service requirements as all other Jewish Israelis. Haredim have been subject to the law since Aug. 1, and will be until the Knesset passes a new law on haredi service. 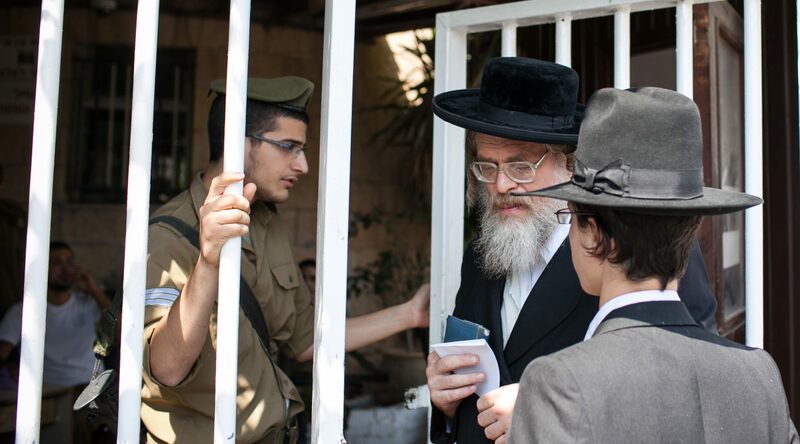 Under the 1986 law, 18-year-old haredi boys — until now exempt from the military draft while studying in a yeshiva — are eligible for the draft; their summons may come even before their 18th birthday. The penalty for refusing the summons: three years in prison. The law includes a clause on religious exemptions from military service for women who observe Shabbat and keep kosher, but they do not apply to men. Men up to the age of 26 may be drafted, haredi or not. Now haredi men born in 1994 and 1995 are or soon will be undergoing competency tests in math, Hebrew and general knowledge, as would any draftee. The first language of many haredim is Yiddish, not Hebrew, and their schools do not focus on math or general studies. The military source could not give any details on the formulation of guidelines for haredi enlistment, but said the monthlong period was granted in part to allow the army time to prepare for absorbing thousands of haredi soldiers. According to Haaretz, there are 54,000 haredi men of enlistment age who have not served in the IDF. But even as the protests have died down, observers on both sides of the issue do not expect the controversy to be solved or a new law to be passed anytime soon. “Right now there’s not a general feeling that something major is going to happen because of the political consternation,” said Rabbi Jonathan Rosenblum, a columnist for Mishpacha magazine, a major haredi publication. Rosenblum, of Jerusalem, said that when the coalition broke up, “the sense of panic diminished considerably” in the haredi world. During government negotiations on a new law on the matter last month, the major proposals suggested fines for draft dodging, while others eschewed the idea of personal penalties. A leading official in Hiddush, an Israeli organization that advocates for religious pluralism and equality, also does not expect new legislation — and a haredi draft with teeth — to move forward soon, despite his best hopes. Ilan said that though most of the Knesset wants to see a new law enacted, no one is willing take the necessary political risks. Rosenblum said that even were such a law to pass, the IDF would not have the resources or will to absorb so many haredi youth, whose strict observance of Jewish law puts them in special circumstances.